Lock in a great price for San Martin Resort & Spa – rated 8.5 by recent guests! The location and actual infrastructure is quite good. The gardens are well kept and the rooms are quite reasonable. Great customer service, beautiful resort surrounded by mother nature. The location is great! Walking distance to the falls entrance. The staff are very friendly and willing to help. The room is a bit small but clean. The air condition was not working in the beginning but the immediately sent someone to fix it after we call and had a follow up checking if it was working. The room had some damp smell but considering it is in the tropical, maybe it is normal. Everything is great about that hotel. Highly recommended if you’re going to the Iguazu Falls and the birds park. Walking distance. The staff was efficient and helpful. We were allowed to check in to our room early. The food buffets were friendly to our plant based diet. The spa had a very nice sauna, Jacuzzi, steam room and pool. The massage therapist Luciana was excellent. The location was walking distance to the Brazilian side Iguazu Falls and the Bird Park. It was also less than a 10 minute drive from the Iguazu IGU airport and the hotel had a free shuttle from the airport to the hotel. There was a nice nature walk on site. The rooms were clean. The externals are very nice, trees and everything. And the stuff, very polite and kind. Great morning buffet and dinner buffet. Would have liked the the option of dinner earlier. Super close to the falls (walking distance), nice bar, and extensive grounds! Good and helpful staff. Excellent location, walking distance from the falls and Parque das Aves, distant from the city, though. Good breakfast. San Martin Resort & Spa This rating is a reflection of how the property compares to the industry standard when it comes to price, facilities and services available. It's based on a self-evaluation by the property. Use this rating to help choose your stay! One of our top picks in Foz do Iguaçu.Located 1,300 feet from the Iguaçu National Park entrance, the 4-star San Martin Resort & Spa invites you to enjoy its leisure activities and nature near the Iguaçu waterfalls. For a fee, guests can enjoy the spa with a sauna unit, hot tub, massage services and relaxation area. In addition to a large swimming pool surrounded by gardens, the San Martin Resort & Spa offers an ecological hiking trail in the surrounding native forests, and several sport facilities, such as volleyball, soccer and tennis courts. 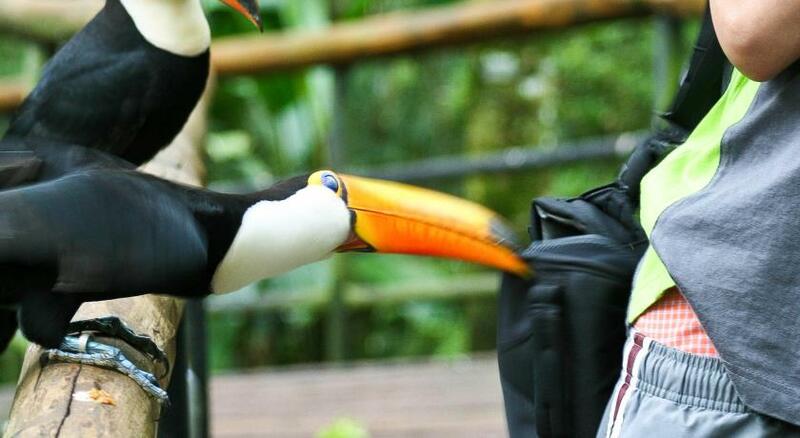 Foz do Iguaçu International Airport is 0.9 mi away and Parque das Aves bird park can be reached in a 4-minute walk. When would you like to stay at San Martin Resort & Spa? This air-conditioned spacious suite offers an LCD TV with satellite channels, mini-bar, laptop, kettle, safe and telephone. It features additional space with a seating area and extra bathroom amenities. Heating is also provided, and WiFi is free. Overlooking the outdoor gardens and forest, this air-conditioned room provides modern décor, an LCD TV with satellite channels, minibar, laptop safe and telephone. Free Wi-Fi is included. Overlooking courtyard gardens, this air-conditioned room has an LCD TV with satellite channels, minibar, laptop safe and telephone. Heating is also provided. Free Wi-Fi is included. House Rules San Martin Resort & Spa takes special requests – add in the next step! San Martin Resort &amp; Spa accepts these cards and reserves the right to temporarily hold an amount prior to arrival. San Martin Resort & Spa accepts these cards and reserves the right to temporarily hold an amount prior to arrival. Please note that the free transfer is available only for arrivals between 07:00 and 18:00, at Foz do Iguaçu International Airport in Brazil. For arrivals out of that range there is an additional fee per person and per transfer. Guests must request this service in advance (up to 48 hours before check in) and send to the property the flight details. The return transfer is available with a surcharge. There is a real disparity between the quality of the staff. The barman during the day on the pool was fantastic. The lady in charge of trips was fantastic. The barman in the bar inside the hotel was good. The receptionist staff are genuinely amongst the worst set of staff I have ever encountered. Firstly I was booked into a room without a bath despite being told I would have one. After being moved we found there was no plug for the bath. Upon asking for a plug for the bath, we were told that we would receive one shortly. It never arrived. I returned on two separate occasions - it still never arrived. I don't think smiling and nodding sweetly ir saying I forgot is good service. Having watched one of the receptionists deal with another customer who was asking for advice on taking a trip, all he told her was how easy it was. A little well-chosen advice which genuinely have made her trip better. Many of the staff are lazy and incompetent. Food is truly terrible and overpriced. How a qualified chef can make chicken breast that dry I do not know. Breakfast is anongst the worst I have had in Brazil. This could be a lovely hotel... but it is not. Food could be a bit better. More variety at breakfast. Spacious room, very clean, swimming pool and facilities were awesome. Hope there is a small kettle for boiling some hot water. Perfect location for seeing the Iguazu Brazilian side and the bird park. I stayed in super class double room. Comfortable, clean room,very good shower. I liked to have a tea or a juice in the cafe in the hotel and service was execellent. The front desk staff was professional and friendly. I was so pleased that they let me to have an early check in so that I could enjoyed the Iguazu Fall and the bird park right after a 30 minutes quick rest. The breakfast was good. I will stay here again if I and my family are in Iguazu Brazilian side. Highly recommend! Everything was just amazing! The staff were nice,professional and always smiling and we really felt like home! They offered us a late check out without any extra fee! The hotel has a very good location as well few minutes walk from the falls and birds park! Thank you for everything! The restaurant didn't open until 7.30 p.m. so we ate in the bar. The food was very bland and there was no salad. The nebourhood to the National Park, the wunderfull garden and pool area. The quality of the food either at the Breakfast or Dinner, taking into account that there.are not any other restaurants in the neighborhood.